It is said that as time passes, one’s memory of events as they actually happened becomes less clear. We become selective in what we remember. I don’t believe it! We can all recall at least one day or an event from our past that remains as vivid in our minds as if it had happened yesterday. This is my “yesterday” story. It was a Friday afternoon, a very warm and somewhat breezy afternoon. At least the wind was cooling things down a bit. Home was a welcome haven after another busy week at work. Janet was still at work and would not be home until sometime after eight. Our youngest daughter Tanya was asleep in the master bedroom recovering from an overnight school trip to the Copeland Forest. Tracey, our middle child was downstairs watching TV with her boyfriend Tom. Todd, our son had a doctor’s appointment at 4:45 pm. and he had gone there directly from his summer job at the city hall. There was lots of time to read the Toronto Star and the Barrie Examiner before getting supper prepared. At 4:28 the hydro went off. No problem. We would just order in pizzas for supper instead of cooking. It was getting a little dark outside and starting to rain lightly. It is now 4:50 and the pizza has been ordered but there might be a short delay because their hydro is off as well. I moved to the chair in front of the picture window and turned to the sports section of the Star. How about those Blue Jays? How about the rain? It was getting very dark and the winds were picking up intensity. The rain was now coming down in torrents. “Hey guys. Come upstairs and see the rain. 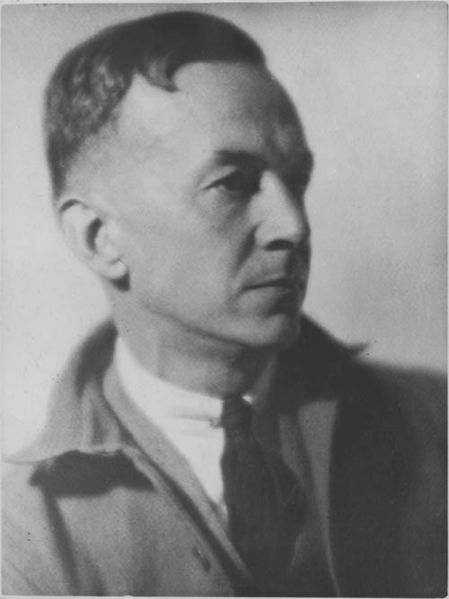 It is almost going sideways,” I yelled enthusiastically. What was that? It looks like shingles, lots of roof shingles. A tree that the city had planted on our boulevard some sixteen years before disappeared in an instant. The black sky was now very ominous and filled with debris that was whipping up the street. “Stay downstairs! !” I screamed at the top of my lungs. Tanya is still sleeping in the master bedroom. I must get her downstairs to safety. I frantically run down the hall towards the bedroom shouting for Tanya. Steps away from the bedroom, the whole house begins to shake. There is an unimaginable roar. It sounds like you are in the middle of a freight yard with trains bearing down on you from every direction. In a flash the three bedrooms disappear. The roof above my head is gone as well. What remains of the walls around me has been pierced by shards of glass and twisted pieces of wood. In seconds that seemed like an eternity it is over. The storm had passed through. It was followed by a deathly and eerie silence. But wait. I hear Tracey screaming from downstairs. Then I hear another voice. Is that Tanya? “Dad, are you alright?” they shout in unison. 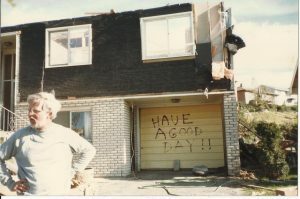 This was John Dobson’s house on 411 Innisfil Street. 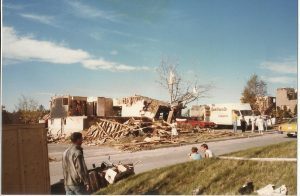 It was one of over 264 homes that were completely destroyed by the tornado. Another 115 homes were heavily damaged and 230 more homes sustained minor damage. The debris wrapped around the tree is the metal roofing from one of the 12 factories that were totally destroyed on Morrow Road. Morrow Road is 1.5 k away. John Dobson like many others chose not to rebuild and the property was sold “as is” to a contractor looking for an opportunity to turn a quick profit. 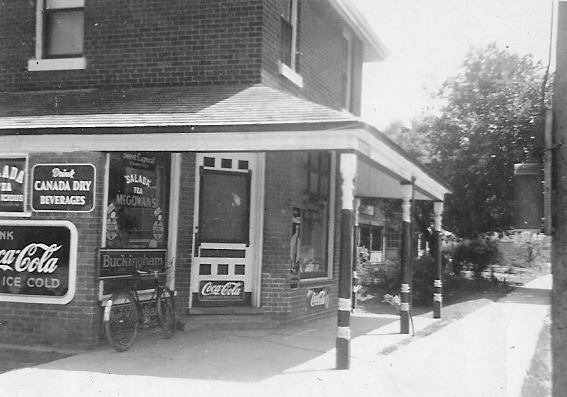 The house was rebuilt but it bears no resemblance to the original one. The tree did not survive. It would be many years before any trees would be that tall again. I run back down the hallway to see them at the base of the stairs. That day of all days Tanya chose to sleep downstairs. She was just too tired to climb the stairs to the bedroom. Remarkably everyone was safe even our beloved dog Barney. Tracey’s friend Tom has several cuts on his leg but it will be hours before he will get medical attention. The only “injury” that I have is a scalp that will inexplicably ache until the next day. After our initial euphoria, we dared to venture outside. The elation that we had just experienced was quickly replaced by horror. It looked like a bomb had been dropped in the middle of Innisfil Street. Every house within sight had been destroyed by the fury of the storm. There were no familiar landmarks. The street, now impassable, was filled with debris from what used to be factories, houses and the Barrie Raceway. 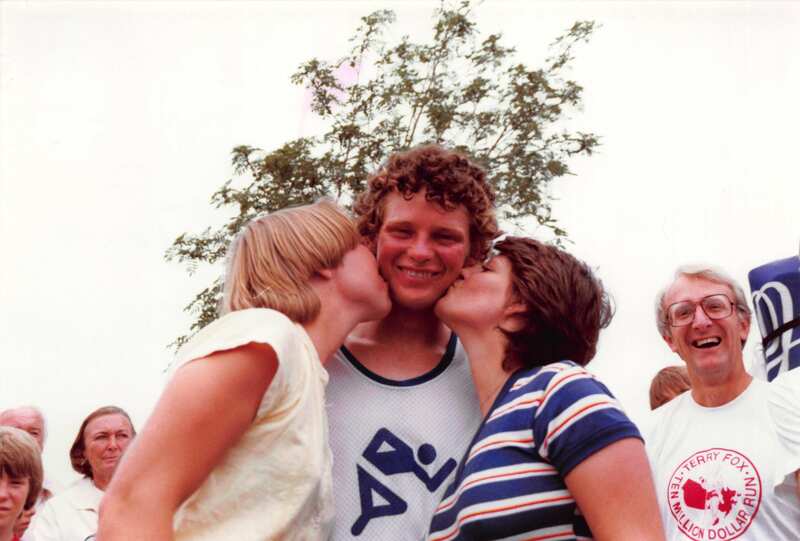 It was 5:02 pm., May 31, 1985. In the distance we can hear the sounds of sirens. On what used to be our street, a few cars tried to weave their way through the rubble in a frantic race to get home. Then we heard the faint shouts from across the road. Tom and I rushed to the source of the calls for help. In what once was John Dobson’s kitchen we found Mr. Dobson buried under his overturned kitchen stove. Amazingly he too had escaped serious injury. “What happened?” he groggily asked. 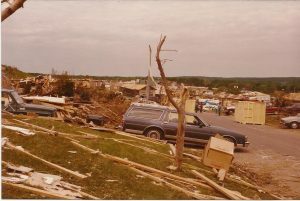 Although we didn’t know it at the time, Barrie had just been hit by a major tornado. 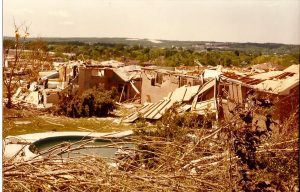 With winds in excess of 400 kph and cutting a deadly swath 300 m wide, the tornado ripped its way through the south end of Barrie leaving carnage and havoc in its wake. Just as we completed our rescue operation, our son Todd came running up the street. Relieved to hear that our family was safe, he told us that he was joining a group of volunteers to begin a house-by-house search of the area. Through the entire night they would look for victims and spray paint the letter ‘X’ on the front door of each house they checked. As he left Todd informed us that everyone was to gather at the St. John Vianney Church where the Red Cross was already setting up a relief shelter. It was now 5:30 pm. Tracey called us to return to our “house”. Much to our disbelief the phone still worked. Janet was on the line. She had heard that there had been a very bad storm and wanted to know if everyone was okay. We assured her that this was the case but told her that she should not try to come home. With the city now in chaos it would take Janet more than an hour to get across town and find us at St. John Vianney. By 6:30 pm the barricades were in place and the evacuation of the damaged area had begun in earnest. We would spend that night with friends, the next six months rebuilding our home and several years rebuilding our lives. Yes it was truly a day to remember. Yes but what lessons did we learn from it? We discovered that the incredible support of family, friends and community are always there in times of need. We also learned that buildings and furniture can always be replaced but you can never replace a loved one. Give those special to you a hug today and tell them how much that you love them.